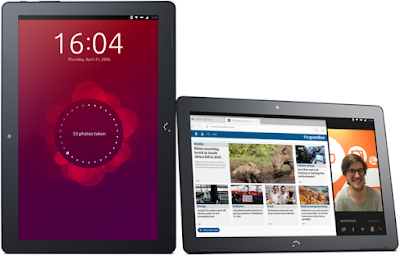 The Aquaris M10 Ubuntu Edition tablet will be available for pre-order on Monday, March 28, in two versions: HD (1280 x 800) and FHD (1920 x 1200). Built by Spanish company BQ, who was the first to release an Ubuntu phone, Aquaris M10 Ubuntu Edition is both the first Ubuntu tablet and the first Ubuntu device to provide a converged experience. The device features a dynamically adaptive interface, capable of providing both a tablet experience as well as a full Ubuntu desktop experience, when using the micro HDMI port to connect it to an external monitor, along with a keyboard and mouse connected via Bluetooth. Update: you can now pre-order the Aquaris M10 Ubuntu Edition: €289.90 for the FHD and €249.90 for HD. There's a special launch offer, which includes a cover and protector. Deliveries will take place starting the second week of April.